I liked going out to play in my Dunlops, they were my passport to freedom and adventure, whilst wearing them I felt invincible, I could go anywhere, it mattered not if they became wet or muddy, wellington boots were the ubiquitous all-purpose footwear of the mid twentieth century and all the boys wore them, summer and winter, on all occasions, but especially for play. Back in the days of my childhood most kids would only have one pair of decent shoes, maybe sandals for the summer and probably daps (plimsolls) as well, so your wellingtons were worn whenever there was a possibility your shoes might get wet, or even a little muddy. In the early 1960s when I was thirteen we moved to a house overlooking Newbridge Fields in Bridgend and this opened up a whole new arena of exploration for a timid and quiet but inquisitive young teenager who was yet to graduate into long trousers. My wellington boots and I had many adventures in the countryside behind our new home; the welcoming woods belonging to the Tennis Club which had enticing boggy marshes with tantalising muddy pools; the spacious open but overgrown meadows with long wet grass that brushed my bare knees and polished my wellingtons making them glisten; the Newbridge Fields with a tempting children’s paddling pool just shallow enough to come to the tops of my boots without flooding them; and the challenging meandering and rapid-flowing but murky River Ogmore, normally out of bounds by parental insistence but visited by all the local boys from time to time daring each other to cross the shallows without filling their wellingtons with river water, only possible during longer rain-free periods when the water level was very low. Probably best of all was the inviting rippling stream known as Parc Brook which could be paddled upstream from the River Ogmore. The stream was deep enough for it to be a challenge and as long as you weren’t careless it was shallow enough not to encounter a sudden and inconvenient overflow resulting in squelching boots and soggy socks. As I was the oldest boy in the area and there were no others even near my age, I would sometimes entertain the elder of the two young boys who lived next door, but only after a reminder from his mother not to lead him into deep water; “When he went with you once before” she reprimanded “he came home with his wellingtons full of water”. She wasn’t going to let me forget that, he was five years younger than my thirteen years and I had accepted the challenge of guardianship of my young charge very seriously and not preventing him from getting a bootful or two was a dent in my credibility as a responsible teenager. A year or two back on a stroll through some of my boyhood haunts I came across this footbridge which I thought had been removed years ago. When I was a lad this was in an open field, with the cows coming down from the fields where Broadlands Estate is now sited, trampling the banks and creating the boggy quagmire mentioned in the above tale. I was surprised to see this section of the area is overgrown now and not at all as it was in the early 60s. This bridge is only yards away from the pavement of Park Court Road with houses built in the late 1960s immediately opposite. 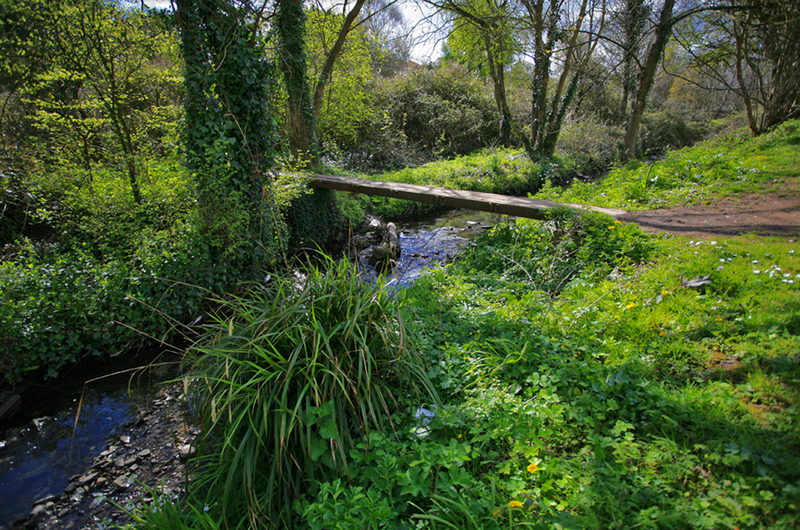 The grass in the meadow mentioned above is now cut short, a new strengthening of an old bridge providing access for the Council’s cutting machine. The whole stream from this section down to the River Ogmore also appears to be sanitised, with grass cut fairly close to the banks, in the 1960s it was a real adventure to wade upstream or downstream, very overgrown, you never knew what was round the next bend! Once again I am grateful to Philip Howard for allowing me to use a couple of photographs from his extensive childhood collection.